A Muslim woman was repeatedly called a ‘dirty f**king bomber’ on a train by a drunk male. The incident occurred at 13:21 GMT on May 28. The Bengali woman, in her twenties, was travelling on the Thameslink network in London with her mother, who wears the hijab when she noticed a man staring at her. Speaking to Tell MAMA anonymously, the woman described how she felt threatened by his stares, given his unkempt appearance and the can of alcohol in his hand. He then mumbled ‘dirty f**king bomber’ several times. The Islamophobic abuse was within earshot of the woman and other passengers. She was able to photograph the perpetrator when safe to do. The perpetrator is said to be a bearded white male, in his 40s or 50s, who spoke with a regional accent, and was wearing a black sports-branded hoodie and black tracksuit bottoms. In our 2016 annual report, 85 incidents (13 per cent) took place on transport networks, which includes all forms of public transport and extends to bus stops, coach stations, train stations and London Underground stations. The British Transport Police are now investigating the incident. In a statement to Tell MAMA, she said: “When he made his remarks and stared in my direction, I felt I had to hide away in my seat and also use a different exit to get off the train to avoid more abuse. “Being referred to as a ‘bomber’ and ‘dirty’ made me feel like I had to be held accountable for something, and that I was beneath others, just because of my skin colour. The post Muslim woman repeatedly called a ‘dirty f**king bomber’ on train appeared first on TELL MAMA. Speaking to Tell MAMA anonymously, one of the men abused, stated that the group of men had given their up their evening to help clean up their local area by litter picking when they witnessed two high-powered sports vehicles collided, adding that at least one of the drivers had fled the scene. Some drivers, however, shouted racist and anti-Muslim abuse at them. The men were called ‘P*kis’ and ‘terrorists’. Hafiz Hamid Raza, the Sialkot Imam who can be heard callously enjoying the destruction of the Ahmadi mosque, (which can be heard in the background), visited the United Kingdom and spoke at the Khatame Nabuwat conference in Derby in 2014. We have listed the video below and which confirms his entry into the United Kingdom. Hafiz Raza was central to the incitement that led to the destruction of the Ahmadi mosque on the 23rd of May in a town that has not had such sectarian tensions below. Residents of Sialkot have generally been immune to sectarian tensions and this development is therefore even more shocking. 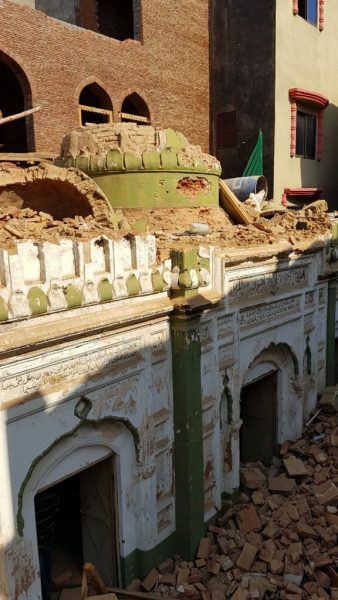 The destruction of the mosque took place a few days ago as people literally tore the place of worship apart brick by brick. Anti-Ahmadi hatred pervades widely into Pakistani society and has gone unchecked for decades, though it is also found in the United Kingdom. Anti-Ahmadi statements, graffiti on mosques and intimidation outside Ahmadi mosques have taken place in this country and continue to take occur without any real focus on the intolerance and institutionalised hatred that impacts on this well integrated and peaceful Muslim community. It is as if, institutional anti-Muslim hatred, does not exist for some Muslims when it affects Ahmadi Muslims in the UK. Hafiz Raza’s central role in the destruction of the Ahmadi mosque should bring into question, his future access and entry to the United Kingdom. According to Home Office guidelines and rules, his actions should essentially bar from him future entry to the United Kingdom, as his presence would more than likely be considered to be ‘not conducive to the public good’. Yet, it also brings into question the kinds of speakers that attend Khatame Nabuwat conferences. We will be reviewing the situation as it develops. You can imagine our shock when we realised this evening that an Islamist extremist who lauded the brutal murder of Glasgow shopkeeper, Asad Shah, was on Twitter. Worse still, he had a ‘verified’ blue tick next to him, giving him some legitimacy in the eyes of member of the public. The individual, Khalid Hussain Rizvi has been highlighted by us in Faith Matters many times. If you want to know what Rizvi is about, just take a look at this video which we compiled on just a few of his sayings to large congregations in Pakistan. In a bizarre twist, we even commented on Rizvi in 2016, and his comments were made to fawning congregations where he describes a telephone conversation with Tanveer Ahmed, the brutal murderer of Asad Shah. Rizvi has called Ahmed a ‘hero’ on many occasions and a ‘lion’ for the brutal stabbing to death of Asad Shah, a much loved shopkeeper in Glasgow. In September 2017, Rizvi’s political party, Tehreek-e-Labaik, polled 7,000 votes in local municipal elections in a by-election in Lahore. The only campaigning point was the lionising of bodyguard Mumtaz Qadri, who murdered Punjab Governor, Salman Taseer. The murder was based on Taseer’s defence of imprisoned Christian female, Asia Bibi. Tehreek-e-Labaik have also latched onto Tanveer Ahmed as another person whom they have lionised, thereby pushing the view that ‘blasphemers’ and those who protect minorities, are fair game for murder. Twitter are therefore providing a ‘verified’ Twitter platform to the spiritual leader of Tehreek-e-Labaik, Khalid Hussain Rizvi. 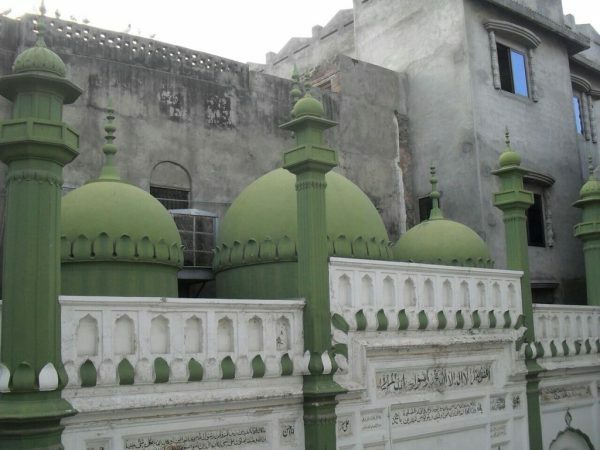 Rizvi, is in effect, an Islamist sympathiser who agrees with the violent extremism, particularly if it is against those protecting and advocating for minorities and Ahmadi Muslims in Pakistan. Given the facts, there is no justification that Twitter can provide for keeping Rizvi’s Twitter account open. Faith Matters has been at the vanguard of writing about entryism by far right groups from Poland, who are seeking to access members of settled Polish communities in the United Kingdom. The aim is pretty simple. 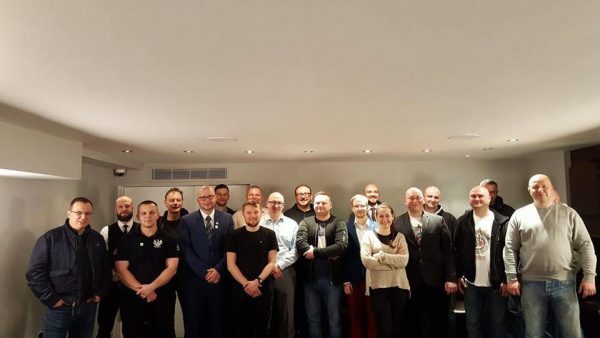 With over 700,000 settled members of Polish communities in the country, they make an accessible and ready pool of potential volunteers, supporters and donours to the extreme causes of such groups. It really is as simple as that. 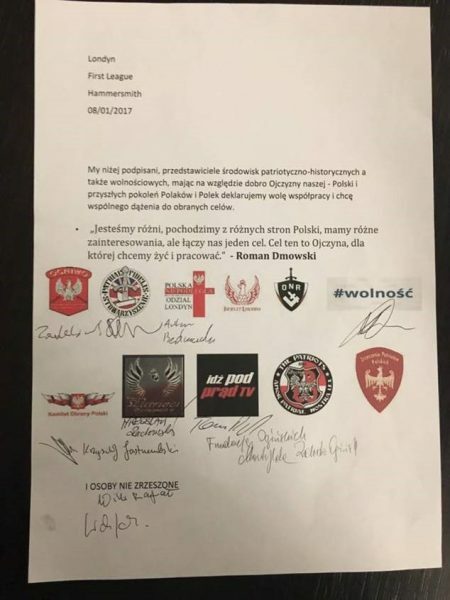 We have written extensively about groups like Ogniwo, Leszek Żebrowski, Grom Legion, Janus Korwin-Mikke (and his group – Liberty), and the neo-fascist ONR. The comments and actions of such groups and individuals run contrary to the pluralism and the tolerant values that are part and parcel of our country. Today, we can exclusively reveal that in January 2017, many of these groups signed a letter of alliance or partnership which is chilling. It was signed in Hammersmith in London and includes neo-fascist groups, ONR (Oboz Narodowo-Radykalny) and Ogniwo. It is ironic that the agreement was signed in London, when the groups want to live and work for the ‘Fatherland’ – Poland. A picture of the signatories and list of groups is highlighted below. This is clearly a worrying development, given some of the groups involved and the ideology of them. It also further adds to our argument that resilience, or rather the lack of it within Polish communities, means that many of these groups can conduct entryism for influence, pretty easily. As we draw closer to the end of the first week in Ramadan, I am eager to reach out and reaffirm our continued support to Muslim communities throughout the United Kingdom. Ramadan is for me as well as for many others, a very special month, a month of spirituality and reflection, a month of family gatherings, a month where I would be looking forward to coming back home to be with my family, a month where all of us would sit around the table for a whole month at the same time to break our fast, and then get ready to visit the Al-Aqsa mosque for ‘Taraweeh’ prayers. This is, after all, a month filled with love, compassion and solitude. A month that is like no other. Masjid Al-Aqsa, AlQuds | Al-Aqsa Mosque, Jerusalem. © Iman Atta. I miss spending Ramadan in Jerusalem, where you would hear the sound of the canons firing off to indicate the breaking of the fast in the evening alongside the adhan (call to prayer) when we all rush to our seats at the dining table to break our fast. I miss the sounds of merchants down the Old City of Jerusalem as you walk down the streets heading to pray. I miss the smell of the spices and the Arabic coffee when walking down the city, and most of all, I miss the smell of history that the Old City walls. We all have our memories of Ramadan, and mine will always be of Jerusalem and its spirituality and holiness. A city that is where my heart is and where my life began. During this Ramadan, Tell MAMA is proud to reaffirm its commitment to your safety through the ties of kinship and support. 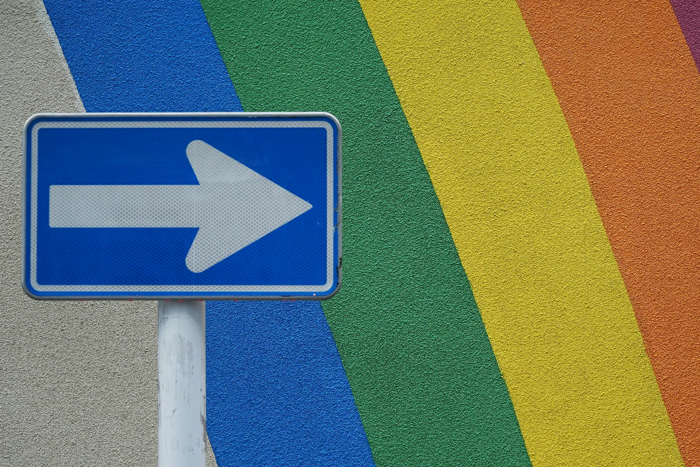 We believe in the fundamental right to practise religious beliefs, suffice that they are not actively harmful to others, free from bigotry, hatred, or violence. This freedom extends to the right to wear religious clothing, the right to speak openly about your beliefs or to partake in religious worship. Tell MAMA acknowledges and will continue to acknowledge the lived experiences of those who use our support service. Our understanding of how racism, prejudice, Islamophobia and discrimination against Muslim communities is shaped, enables us to recognise how attitudes manifest in the public and within institutions which can harm the aspirations and life experiences of Muslims in Britain. This has been highlighted in our report on ‘A Constructed Threat: Identity, Prejudice and the Impact of anti-Muslim Hatred’ and previous reports. We will continue to be highlighted through our work. Freedom of expression is a vital tool but it comes with a responsibility to not harm the dignity of others or promote racial hatred or violence. 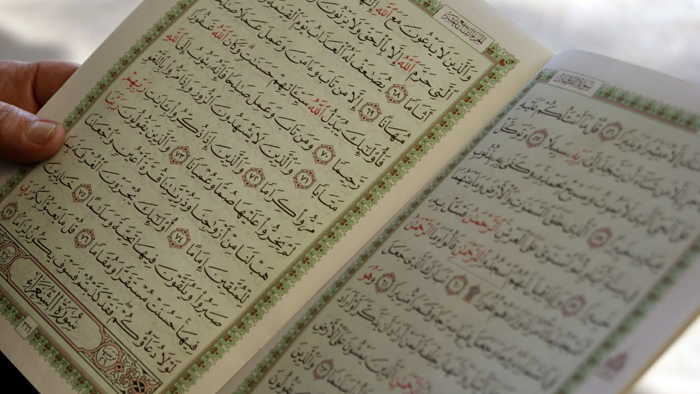 Sadly, for some, a disproportionate hatred of Islam is often interchangeable with a hatred of Muslim individuals, whereby hostility toward largely minority communities is hidden behind a critique of their religious beliefs. Throughout the month of Ramadan, we will be holding iftars across the country, security training sessions and outreach activities. We look forward to seeing you at one of our events. From myself and my colleagues at Tell MAMA, we wish you a Ramadan Kareem and Mubarak and we will continue our journey in serving the communities in tackling anti-Muslim hatred, Islamophobia, prejudice, discrimination, and racism in all its forms and working against any injustice we see. The post A Ramadan message from Tell MAMA appeared first on TELL MAMA. This Sunday, Janusz Korwin-Mikke will be speaking in London in Hyde Park. Previously a member of the European Parliament, he is no stranger to controversy. Korwin-Mikke has previously stated that Hitler knew nothing about the Holocaust. This is another turn in the worrying trend of speakers from Poland who are entering into the UK with such views. Faith Matters has raised concerns before, since people with such comments are not assisting integration or supporting cohesive communities in the UK. Their past history and their comments simply cause divisions and there is a real attempt to inject these views into the UK context and sphere where there are between 700,000 to 800,000 people of Polish heritage in the UK. Some of Korwin-Mikke’s statements are breath-taking. He states that the best way to deal with Muslims in Europe is to keep them out and ban them from building mosques and “if need be, oppose them militarily”. Commenting on the Charlie Hebdo terrorist attack in France, he said that the terrorists “exaggerated” (their response), as they should have only given the Charlie Hebdo ‘blasphemers’, a few lashes instead of killing them. Had they done that, “half of Europe would have applauded them”. In the same tweet he added, “It’s the same thing fighting against anti-Semitism. The Jews exaggerate and then they are surprised anti-Semitism is on the rise. And as usual, it will end with pogroms”. Korwin Mikke’s has also suggested that Germany should introduce religious apartheid as a solution to problems caused by Muslims. “The world is collapsing. 150 years ago, we white people, ruled the world. Today, we are being colonised…….We colonised Africa, it wasn’t the Negroes who colonised Europe. It’s something to be proud of. I am proud of my civilisation”. During a debate on youth unemployment in the EU Parliament, Korwin-Mikke referred to black people on several occasions as “niggers”, stating that the “minimum wage should be destroyed as we would be treating 20 million young Europeans like niggers”. These are just the array of comments associated with the former EU Parliamentarian. Yet it brings to light again how such people are being invited to speak in the UK and to possibly normalise these views into settled communities of Polish heritage. Faith Matters has highlighted the issue of entryism into settled communities of Polish heritage in the UK. What we are seeing is a co-ordinated effort by groups and speakers to enter into the UK and poison the minds of people. This is not just unacceptable, it is time that the Her Majesty’s Government seriously look at this issue and the various groups and speakers we have highlighted.